After achieving a global first last year by selling train tickets through Alexa, the new development in collaboration with Amazon means that Virgin Trains customers can now book JourneyCare via Alexa-enabled devices, including the Amazon Echo. Following trials, the new JourneyCare feature is now live for anyone requiring assisted travel (for example those with visual impairment or mobility issues). Normally customers who need to book JourneyCare complete a form online or call the helpline after booking. The new technology means customers can book assisted travel immediately after purchasing tickets using simple voice commands. Chris Tomson took part in the initial testing of the Alexa skill. He has Osteogenesis imperfecta (brittle bones) and uses a wheelchair on a daily basis. The traditional system meant customers had to input the same information again to request JourneyCare after booking a ticket, but the Virgin Trains skill for Alexa will remember the details, so they do not have to repeat the process. On average the new service takes just two minutes, halving the time needed to complete an online form or call the helpline. 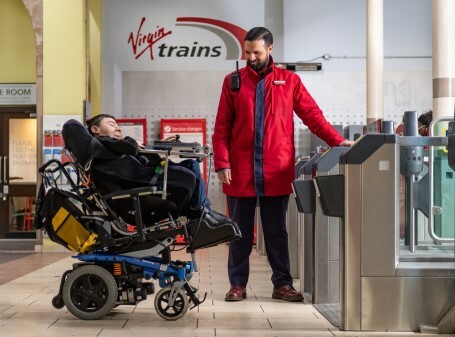 Stephen Brookes, Rail Sector Champion for the Minister for Disabled People, said: “I welcome the new initiative by Virgin Trains, which will give disabled people a better booking experience. “By utilising Alexa in this way, Virgin Trains recognises the importance of disabled people as being a key part of rail industry business, because those who are comfortable with and can access technology will find the system quick and efficient.